THE MACANA IS A PUTTER FOR PLAYERS THAT LIKE A BEADED DEEP RIM PUTTER, BUT FEEL LIKE THE DAGGER IS JUST A LITTLE TOO DEEP. The Macana is a putter for players that like a beaded deep rim putter, but feel like the Dagger is just a little too deep. Stable in flight, it will serve you well as both a putter and a short range driver. 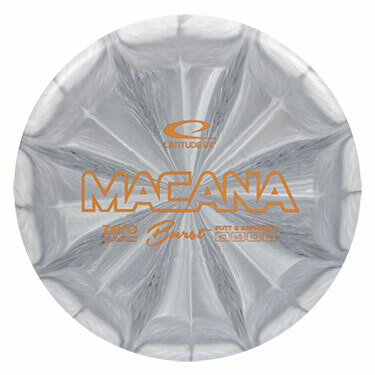 The Macana has little fade and good glide. The name Macana refers to old wooden weapons used by native cultures of Central and South America. If you feel like every green is a constant battle ground perhaps the Macana can help you win the war! Zero Zero Line is the soft grippy putter plastic used in our putters and approach discs. The plastic is chosen because of the good grip and feel. The feel you need in your short game! We have received much demand for softer Zero Line discs, so we will make an effort to deliver that during 2013.